Match cyan candies to feed sprinkleshell to break Soda Bottles. This level has medium difficulty and you need to use good technique to complete this level. 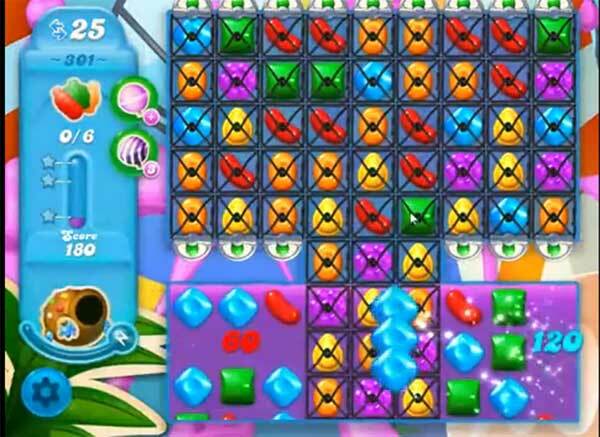 For this level you should try to break same color candies of sprinkleshell and as it get full choose any color candy to break grills. This will help to break also soda bottles that you require to break them to reach the target. Or you should play above the soda or make special candies like striped candy to break soda bottles to reach the target. Why can I not have access to utube video????????? ?